The stadium had a fiberglass fabric roof that was self-supported by air pressure and was the third major sports facility to have this feature (the first two being the Pontiac Silverdome and the Carrier Dome). The Metrodome was similar in design to the former RCA Dome and to BC Place, though BC Place was reconfigured with a retractable roof in 2010. The Metrodome was reputedly the inspiration for the Tokyo Dome in Tokyo, Japan. The stadium was the only facility to have hosted a Super Bowl (1992), World Series (1987, 1991), MLB All-Star Game (1985) and NCAA Division I Basketball Final Four (1992, 2001). 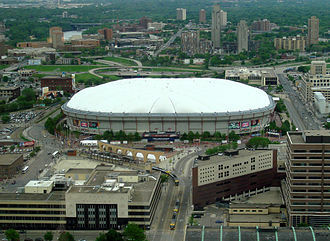 The Metrodome had several nicknames such as "The Dome", "The Thunderdome", and "The Homer Dome." Preparation for the demolition of the Metrodome began the day after the facility hosted the final home game for the Minnesota Vikings on December 29, 2013, with actual demolition beginning on January 18, 2014. The Metrodome was torn down in sections while construction of U.S. Bank Stadium began. The 1991 World Series is considered one of the best of all time. [according to whom?] The blue colored seat back and bottom where Kirby Puckett's 1991 World Series Game 6 walk off home run landed in Section 101, Row 5, Seat 27 (renumbered 34 after the home run in honor of Kirby), is now in the Twins archives, along with the gold colored back and bottom that replaced it for a number of years. The Twins reinstalled a blue seat back and bottom as well as Puckett's #34 on the seat where it remained until the final Vikings game of 2013 in the Metrodome when, as local media reported, a fan took the #34 plate off the seat. The original World Series armrests and hardware, as well as the replacement blue seat back and bottom, are now part of a private Kirby Puckett collection in Minnesota. From the time the stadium was built to when it was demolished, the economics of sports marketing changed. Teams began charging higher prices for tickets and demanding more amenities, such as bigger clubhouses and locker rooms, more luxury suites, and more concession revenue. Team owners, the media and fans pressured the State of Minnesota provide newer, better facilities to host its teams. The Metrodome served its primary purpose: to provide a climate-controlled facility to host the three sports tenants in Minnesota with the largest attendance. For Major League baseball, the Metrodome was regarded as a hitter's park, with a low (7 ft) left-field fence (343 ft) that favored right-handed power hitters, and the higher (23 ft) but closer (327 ft) right-field Baggie that favored left-handed power hitters. Because the roof is very nearly the same color as a baseball, and transmits light, the Metrodome had a far higher error incidence than a normal stadium during day games, so instead of losing a fly ball in the sun, as is common for non-roofed stadiums, fly balls could easily get lost in the ceiling. Unlike most parks built during this time, Metrodome's baseball configuration had asymmetrical outfield dimensions. The Metrodome's air-supported roof was designed by the inventor of air-supported structures, David H. Geiger, through his New York-based Geiger Berger Associates, and manufactured and installed by Birdair Structures. An air-supported structure supported by positive air pressure, it required 250,000 ft³/min (120 m³/s) of air to keep it inflated. The air pressure was supplied by twenty 90 hp (67 kW) fans. The roof was made of two layers: the outer layers were Teflon-coated fiberglass and the inner was a proprietary acoustical fabric. By design, the dead air space between the layers insulated the roof; in winter, warm air was blown into the space between layers to help melt snow that had accumulated on top. At the time it was built, the 10 acres (4.0 ha) of fabric made the roof the largest expanse ever done in that manner. The outside Teflon membrane was 1/32 of an inch thick and the inner liner of woven fiberglass was 1/64 of an inch thick. The entire roof weighed roughly 580,000 pounds. It reached 195 ft (59 m), or about 16 stories, at its highest point. To prevent roof tears like those that occurred in its first years of service, the Metropolitan Sports Facilities Commission adopted a twofold strategy: When snow accumulation was expected, hot air was pumped into the space between the roof's two layers. Workers also climbed on the roof and used steam and high-powered hot-water hoses to melt snow. In addition, before the storm that caused the December 2010 collapse, the inside of the stadium was heated to nearly 80 °F (26.7 °C). A severe winter storm arrived on December 10–11, 2010, with over 17 in (43 cm) of snow accumulation, and strong winds; those winds made the roof unsafe for the snow removal crew. As the workers were pulled back, the roof was already sagging in the center. On December 12 at about 5:00 a.m., the roof had a catastrophic collapse as three panels tore open. The night before, a Fox Sports crew setting up for an upcoming Vikings game noticed water leaking from the roof and kept their cameras on all night; those cameras captured the roof tearing and ice and snow falling into the stadium. No one was injured. Most of the roof sagged and came to rest on cable stays. The collapse caused no damage inside the stadium aside from a light fixture and some seats. The turf was not damaged; a drainage system designed for cleaning purposes allowed the field to dry out. On December 15, 2010, a fourth panel ripped open, sending more snow and ice into the dome. The Vikings and the New York Giants had been scheduled to play an afternoon football game on December 12. The game was postponed to the following night due to concerns of stadium officials. Because of the tears in the roof, the NFL relocated the game to Ford Field in Detroit. The league considered moving that game to the University of Minnesota's nearby TCF Bank Stadium, but it had been closed and winterized for the season and would have needed several days to prepare for a football game. Tickets to the game were free, and the Giants ended up winning the game. Due to roof repair time estimates, the Vikings December 20 game against the Chicago Bears was moved to TCF Bank Stadium. The final two games for the 2010 Minnesota Vikings season already were scheduled as road games, and the team had already been eliminated from the playoffs. On February 10, 2011, it was announced that the entire Metrodome roof needed to be replaced at an estimated cost of $18 million. In November 2010, the University of Minnesota men's baseball team had announced plans to play all of their 2011 games at the Metrodome; however, the roof collapse caused those plans to be abandoned. On February 18, 2011, the Gophers announced that all 12 scheduled Big Ten home games in April and May would be played at Target Field, with three non-conference games moved to on-campus Siebert Field. Metrodome field, in its baseball configuration. The football markings are slightly visible under the turf. This surface was upgraded to Astroturf in 1987, and in 2004, the sports commission had a newer artificial surface, called FieldTurf, installed. FieldTurf is thought to be a closer approximation to natural grass than Astroturf in its softness, appearance, and feel. A new Sportexe Momentum Turf surface was installed during the summer of 2010. From 1985 to 1994, the left-field wall included a 6-foot (1.8 m) clear Plexiglas screen for a total height of 13 feet (4.0 m). It was off this Plexiglas wall that Twins player Kirby Puckett jumped to rob Ron Gant of the Atlanta Braves of an extra-base hit during Game 6 of the 1991 World Series (a game that Puckett would win with an 11th-inning walk-off homer) – in later years, with the Plexiglas removed, it would have been a potential home run ball. Metrodome's "baggie" in right field. The Metrodome's right-field wall was composed of the 7-foot (2.1 m)-high fence around the whole outfield and a 16-foot (4.9 m)-high plastic wall extension in right field, known as the "Baggie", or the "Hefty Bag." The seats above and behind the Baggie were home run territory; the Baggie itself was part of the outfield wall. Fenway Park's "Green Monster", a comparable but taller feature, is 17 feet (5.2 m) closer to home plate than the Baggie was, so batters who hit short, high fly balls were not typically helped by it. However, it was an attractive target for left-handed power hitters, and it was not uncommon for upper-deck home runs to be hit to right field. When in a rectangular configuration for football and other small-field events, the Baggie was taken down and the seats behind it extended to form complete lower-deck seating. Inside the Metrodome during a Vikings game in 2013. Action during a 1999 Vikings game, from a location similar to 2004 ALDS photo. Note the retractable seats in the lower-right portion of this photo. Pre-game activities at a Vikings game in December 2007. The Vikings played their first game at the Metrodome in a preseason matchup against the Seattle Seahawks on August 21, 1982. Minnesota won 7-3. The first touchdown in the dome was scored by Joe Senser on an 11-yard pass from Tommy Kramer. The first regular-season game at the Metrodome was the 1982 opener on September 12, when the Vikings defeated Tampa Bay Buccaneers, 17-10. Rickey Young scored the first regular-season touchdown in the dome on a 3-yard run in the 2nd quarter. On January 9, 1983, the Vikings defeated the Atlanta Falcons, 30-24, in a 1st-round game that was the first playoff game at the Metrodome. On January 17, 1999, the Falcons defeated the Vikings in the first NFC championship game played at the dome. On December 29, 2013, the Vikings played their final game at the Metrodome, a 14-13 victory over the Detroit Lions. The team's all-time record at the dome was 162-88 in the regular season and 6-4 in playoff games. They finished with a perfect record at the dome against the Arizona Cardinals (8-0), Baltimore Ravens (1-0), Cincinnati Bengals (4-0), and Houston Texans (1-0), but with a winless record there against the New York Jets (0-3). NFL owners voted during their May 24, 1989 meeting to award Super Bowl XXVI to Minneapolis over Indianapolis, Pontiac and Seattle. 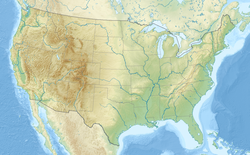 The game on January 26, 1992 was the second Super Bowl to be played in a cold, winter climate city. The first one was Super Bowl XVI on January 24, 1982 in Pontiac, Michigan. The Washington Redskins defeated the Buffalo Bills 37-24. When opened in 1982, the Metrodome was appreciated for the protection it gave from mosquitoes, and later the weather. Over the years there had been a love-hate relationship with the fans, sportswriters, and stadium. The Minnesota Twins won two World Series championships at the Metrodome. The Twins won the 1987 World Series and 1991 World Series by winning all four games held at the Dome in both seasons. The loud noise, white roof, quick turf, and the right-field wall (or "Baggie") provided a substantial home-field advantage for the Twins. The 1991 World Series has been considered one of the best of all time. By 2001, several newer purpose-built Major League Baseball stadiums had been constructed, and the Metrodome was considered to be among the worst venues in Major League Baseball. Only two Twins games at the Metrodome were ever postponed. The first was on April 14, 1983, when a massive snowstorm prevented the California Angels from getting to Minneapolis. The game would have likely been postponed in any case, however; that night heavy snow caused part of the roof to collapse. The second was on August 2, 2007, the day after the I-35W Mississippi River bridge had collapsed a few blocks away from the Metrodome. The game scheduled for August 1 was played as scheduled (about one hour after the bridge had collapsed) because the team and police officials were concerned about too many fans departing Metrodome at one time, potentially causing conflict with rescue workers. The August 2 ceremonial groundbreaking at the eventual Target Field was also postponed, for the same reason. The Metrodome carried a memorial decal on the backstop wall for the remainder of the 2007 season. The final Twins game at the Metrodome was on October 11, 2009, when they lost to the New York Yankees 4–1, resulting in three-game sweep in the 2009 ALDS. The Twins' appearance in this series gave Metrodome the distinction of being the first American League stadium to end its Major League Baseball history with post-season play. 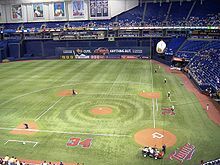 The only other stadiums whose final games came in the post-season are Atlanta Fulton County Stadium (1996), the Houston Astrodome (1999) and St. Louis's Busch Memorial Stadium (2005), all of which were home venues for National League teams with the departure of the Twins this leaves the Tampa Bay Rays the last remaining major league team to play their games in a domed stadium. Metrodome set up for the 2009 NCAA Men's Basketball Tournament; temporary stands enclose the basketball court on two sides with the permanent stands on the other two. Metrodome during Gophers game in 2003. The Metrodome in 2008, before the 91st battle for the Little Brown Jug rivalry game between the Minnesota Golden Gophers and Michigan Wolverines. The Minnesota Kicks were supposed to move into the Metrodome for the 1982 NASL season. However, the franchise folded in November 1981. The Minnesota Strikers played the 1984 NASL season at the Dome. 52,621 saw the Minnesota Strikers defeat Tampa Bay 1-0 on May 28, 1984. MSHSL boys and girls soccer championships were also held at the stadium. The Minnesota Thunder played selected games at the Dome from 1990 to 2009. The Minnesota Stars FC opened their 2012 season at the stadium. The Minnesota United FC used the Dome for the 2013 NASL Spring Season. The field dimensions for soccer at the Metrodome were 110 by 70 yards (101 m × 64 m). The largest crowd to see a soccer game in Minnesota was at the Metrodome. While this was more than suitable for football, with few exceptions this resulted in poor sight lines for baseball. For instance, the seats directly along the left field line faced the center field and right field fences. Unlike other major league parks, there were no seats down to field level. Even the closest front-row seats were at least 5 or 6 feet (1.5 or 1.8 m) above the field. Due to the minimum time needed to convert the field, a baseball game that ran long in clock time had to be suspended, and concluded the next day. The only time this happened was on October 2, 2004, when a game between the Twins and Indians reached the end of the 11th inning after 2:30 pm in a tie and resumed the next day. The Metrodome will also be remembered in NFL history as the site of four of the longest NFL touchdowns in history in terms of yardage. From scrimmage, only 15 plays have ever gone the maximum 99 yards for a touchdown in league history. One of the two runs on that list is by Dallas Cowboys running back Tony Dorsett against the Vikings on January 3, 1983 during a Monday Night Football game. One of the 13 such pass plays is Vikings quarterback Gus Frerotte's connection with receiver Bernard Berrian during a game against the Chicago Bears on November 30, 2008. The Minnesota Golden Gophers football program began playing in Metrodome for the 1982 season. Attendance was expected to increase over the old Memorial Stadium attendance, especially for late fall games, due to the climate controlled comfort. Initially, average attendance had increased over previous seasons at Memorial Stadium. But, the venue was removed from the traditional on-campus football atmosphere if fans wanted to attend a Gophers football game. Students had to take a bus from the campus to the stadium. The distance from the main campus, along with poor performance by the Gopher football team, caused interest to wane. On May 10, 2012, the Minnesota Legislature approved funding for a new Vikings stadium on that site. The project has a budget of $1.027 billion, with the Vikings covering $529 million, the state covering $348 million, and $150 million covered by a hospitality tax in Minneapolis. The bill was signed by Governor Dayton on May 14. The Vikings played in the Metrodome until the end of the 2013 season. The Vikings' temporary home during construction was TCF Bank Stadium. With the approval of the new Vikings stadium at the Dome site by the Minnesota legislature, the fate of the Metrodome was sealed. The Vikings played their final game at the Metrodome on December 29, 2013, beating the Detroit Lions 14-13. The following day, a local company began removal of seats for sale to the public and various charities and nonprofits. Individual chairs went for $40 each to charities, $60 each to the public, and $80 each for specific seat requests. Roof deflated, the Metrodome on February 3, 2014. The roof was deflated for the final time on January 18, starting at 7:15 a.m. The process took about 35 minutes. After the deflation, demolition crews began cutting out individual panels of the teflon roof that would continue all the way up until the morning that the roof cables were severed, and no more than a week after the deflation, the entire loading dock section of the Metrodome was demolished. Much like the first few early phases of demolition, it was decided that the Metrodome would be torn down via wrecking ball, rather than implosion—due to the concern that vibration and dust from an implosion would have on nearby downtown Minneapolis neighborhoods and Hennepin County Medical Center, which sat catacorner from the now-demolished Metrodome. The original demolition plan called for the Metrodome to be torn down section by section in a counter-clockwise motion (starting with the northeast corner of the stadium) as the exterior of the new stadium was built adjacent to and around the continuously-diminishing structure of the Metrodome, as this animation shows: https://www.youtube.com/watch?v=rDnJsZJsH-M However, when part of the concrete ring beam collapsed out-of-sequence during demolition on February 17 (additional information below), the order in which the sections were actually torn down was completely changed and rather disorganized. Nevertheless, all sections were successfully and eventually taken down and no setbacks in the demolition process occurred as a result of the ring beam collapse. On the morning of February 2, 2014, just after 7:30 a.m., the steel support cables that stretched from end-to-end of stadium that held together the roof were severed, as construction crews set off a simultaneous set of 42 explosive charges that detached the cables from the concrete structure. The general public was not informed about this phase of the demolition process, prompting about a half-dozen phone calls to police from people who wondered what was going on. This was viewed as the final step before the destruction of the concrete bowl of the Metrodome would begin. On February 10, 2014, shortly after 9:15 a.m., after more than two months of preliminary work that dated back all the way to the groundbreaking of the new Vikings stadium, demolition of the stadium walls finally began. The Metrodome on February 26, 2014, with about half of its walls demolished. These are the north and west stands. The first game between the Buzz and the Twins in Major League: Back to the Minors is played at the Metrodome. ^ a b c Lowry, Phillip (2005). Green Cathedrals. New York City: Walker & Company. ISBN 0-8027-1562-1. ^ "About Metrodome". Hubert H. Humphrey Metrodome. Retrieved November 4, 2006. ^ a b "Metrodome Demolition Reaches Completion Early". Associated Press. ^ a b "Mall of America Field at the H.H.H. Metrodome Information". Minnesota Vikings. Retrieved February 13, 2016. ^ "Metrodome History" (PDF). Minnesota Legislature. Retrieved February 13, 2016. ^ a b Detroit Lions | Detroit Free Press. freep.com (May 7, 2014). Retrieved on May 12, 2014. ^ Metrodome Memories: The last hurrah..., KARE 11 News, October 5, 2009, Accessed January 18, 2011. ^ Teddy Greenstein, Tokyo Dome Has Touch Of Home For Macphail, Chicago Tribune, March 27, 2000, Accessed January 18, 2011. ^ Holtzman, Jerome (October 9, 1987). "Fans` Din Hits New Heights In The Thunderdome". Chicago Tribune. ^ "Homerdome? It's more like Loserdome now for Twins" Archived 2013-12-03 at the Wayback Machine, Brainerd Dispatch May 13, 2000. ^ Tom Powers: On demolition day, Metrodome won't hold up to Met Center. TwinCities.com. Retrieved on May 12, 2014. ^ New Vikings Stadium: Transition From Old To New Archived 2016-03-07 at the Wayback Machine. Vikings.com (December 3, 2013). Retrieved on May 12, 2014. ^ Klobuchar, Amy (April 1986). Uncovering the Dome (reprint ed.). Waveland Press. ISBN 0-88133-218-6. ^ a b c Smith, Curt (2001). Storied Stadiums. New York City: Carroll & Company. ISBN 0-7867-1187-6. 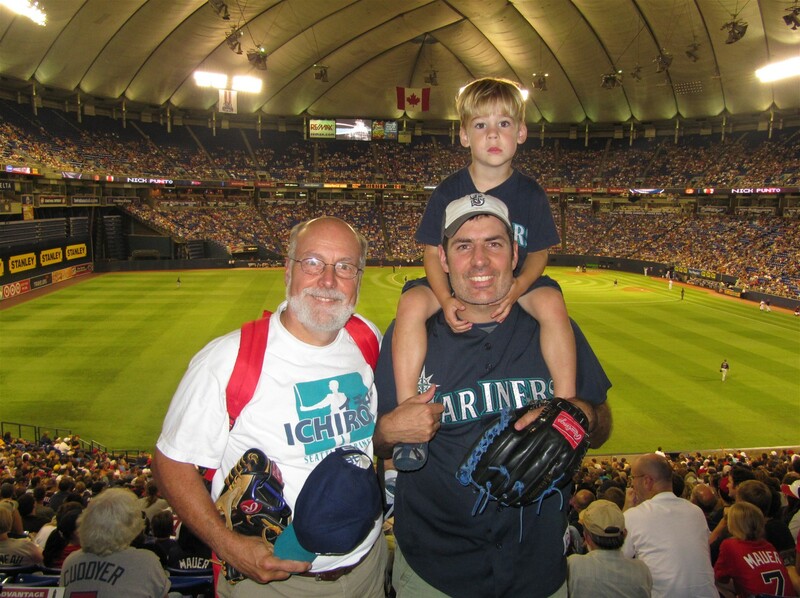 ^ CenturyLink Field, home of the Seattle Seahawks, is the loudest roofed stadium. Arrowhead Stadium, home of the Kansas City Chiefs, is the loudest outdoors stadium. ^ a b Murphy, Brian. Twins' `Overachiever' Kirby Puckett Gets Call to Glory, Baseball Digest, April 2001. Quote: "it was his play in Game 6 of the '91 Series against Atlanta that cemented his legacy in Twin Cities sports history. After robbing the Braves' Ron Gant of a home run in the field, Puckett hit an 11th-inning homer off Charlie Leibrandt to force a seventh game that the Twins eventually won in what some baseball historians consider the greatest World Series ever." ^ "Playoff Site at Site". Wilmington Morning Star. January 4, 1983. ^ "Ranking NFL Stadiums". The Miami News. August 12, 1987. ^ "Bevell's Sore, but Will Play". Milwaukee Journal. October 19, 1983. ^ "National Football Conference". Orlando Sentinel. August 30, 1996. ^ "Vikings' Hopes Dim for Sellout". Star Tribune. Minneapolis. September 10, 1997. ^ "Vikings Notes". Star Tribune. Minneapolis. October 24, 2000. ^ Quirk, James; Fort, Rodney D. (1992). Pay Dirt: The Business of Professional Team Sports [Impact of New Stadiums on Attendance and Performance]. Princeton: Princeton University Press. p. 140. ISBN 0-691-04255-1. Retrieved June 2, 2018. ^ Cordarrelle Patterson ties NFL record with 109-yard kickoff return. CBSSports.com. Retrieved on May 12, 2014. ^ Kamin, Blair (December 12, 2010). "Chicago architects designed Metrodome; New York firm responsible for fabric roof". Chicago Tribune. Retrieved December 13, 2010. ^ Dave Campbell, Dome disaster: Snow wrecks Vikings' home, Associated Press, December 13, 2010, accessed December 13, 2010. ^ Fabric arena shaped by past domes, Engineering News Record, October 1, 1981, Accessed December 13, 2010. ^ a b c d Kevin Duchschere, Paul McEnroe and Kurt Brown, Can splices fix Dome's slices for Bears game?, Star Tribune, December 14, 2010, accessed December 14, 2010. ^ Pat Borzi and Julie Battista, Roof Falls In, Sending the Giants’ Game to Detroit, The New York Times, December 12, 2010, accessed December 13, 2010. ^ Pat Borzi, With Their Dome Deflated, the Vikings Still Need a Home, The New York Times, December 14, 2010, Accessed December 14, 2010. ^ "video clip". Retrieved January 30, 2014. ^ Dee DePass, Judd Zulgad and Dennis J. McGrath, Metrodome roof rips, collapses, Star Tribune, December 13, 2010, accessed December 13, 2010. ^ a b c Regular Meeting, Metropolitan Sports Facilities Commission, July 15, 2010, accessed December 13, 2010. ^ "Video of December 12th's roof collapse". Fox News. December 12, 2010. ^ a b Kevin Duchschere, Crew coming to inspect fallen Dome roof, Star Tribune, December 13, 2010, accessed December 13, 2010. ^ Fourth Metrodome roof panel fails, nobody hurt, Kare 11, December 15, 2010, accessed December 16, 2010. ^ "Snow forces Giants-Vikings reschedule". The Boston Globe. December 12, 2010. ^ Giants-Vikings moved to Ford Field, ESPN.com, December 12, 2010, accessed December 12, 2010. ^ Monday's Vikings-Bears game will be played at U's stadium; Dome won't be ready Archived 2010-12-18 at the Wayback Machine, Star Tribune, December 14, 2010, Accessed December 14, 2010. ^ Duchshere, Kevin and Phil Miller – Dome can't be fixed until spring, Festivals and teams are scrambling as officials said the roof won't be ready for months. Archived 2011-01-01 at the Wayback Machine Star Tribune, December 29, 2010. "Bill Lester, executive director of the Metropolitan Sports Facilities Commission, said on Wednesday that it's not yet clear when the Dome's ripped roof can be fixed but that it won't happen before spring." ^ a b "Gophers Revise Baseball Schedule: Big Ten Home Games at Target Field". Star Tribune. February 19, 2011. Retrieved February 20, 2011. ^ "Metrodome roof repair could disrupt preseason schedule". NFL.com. February 10, 2011. ^ "HHH Metrodome Information". TicketSolutions.com. 2007. Retrieved April 7, 2007. ^ Taking a last look at fixing the Dome for the Vikings[permanent dead link]. Star Tribune. Paul Levy. July 19, 2007 – "A Metrodome renovation is being studied, although Vikings officials say the site really isn't big enough by today's NFL standards." ^ What makes a city Super to NFL? ^ Hurst, Matt World Series 2011: The 5 Best Fall Classic Game 6's Ever Bleacher Report, October 28, 2011 Quote: "The 1991 World Series is easily the best World Series ever played, with three games being won in the final at-bat and four coming down to the final pitch. Kirby Puckett's heroics in Game 6 allowed the Twins to stay alive and eventually win Game 7." ^ Yellon, Al The Top 10 World Series Games, Including (Of Course) 2011 Game 6. Baseball Nation, October 28, 2011 Quotes: "No. 10: 1991 World Series, Game 6: This is the game where Jack Buck exclaimed "And we'll see you tomorrow night!" In addition to Puckett's extra-inning heroics, the Twins' bullpen held theBraves scoreless for the last four innings of the game, allowing just three singles, two of which were erased by double plays." "No. 6: 1991 World Series, Game 7: The Senators franchise moved to Minnesota in 1961; 30 years later, the team played two of the most excruciatingly exciting World Series games on consecutive nights. It's the only Series I'm honoring here with a pair of games. This one featured a 10-inning shutout thrown by Minnesota's Jack Morris while the Twins were leaving 12 men on base, finally scoring the game-winner on Gene Larkin's bases-loaded single with one out in the bottom of the 10th." ^ The World Series 100th Anniversary – No. 1 1991 Minnesota Twins 4, Atlanta Braves 3 ESPN.com Page 2, 2003. ^ Campbell, Dave (August 3, 2007). "Twins back at it, with bridge on minds". USA Today. ^ Wood, Bob (Robert) (1989). Big Ten country: a journey through one football season. Morrow. ISBN 0-688-08922-4. ^ a b c d e f g h i j k l m "Archived copy". Archived from the original on 2014-01-01. Retrieved 2014-01-09. CS1 maint: Archived copy as title (link). City Pages. Erik Thompson. December 27, 2013 – "The Metrodome's musical history: A look back"
^ "2013 Official Stadium Super Trucks schedule". Stadium Super Trucks. April 19, 2013. Archived from the original on October 19, 2013. Retrieved April 19, 2013. ^ "AWA WrestleRock '86 at Metrodome wrestling results". Internet Wrestling Database. 2008. Retrieved December 12, 2010. ^ "RollerDome Homepage". Retrieved December 27, 2007. ^ "Twins-Indians Suspended; Yankees Still Waiting for Playoff Opponent". The New York Times. October 2, 2004. Retrieved April 2, 2010. ^ Borzi, Pat (October 6, 2009). "Making Metrodome a Two-Sport Star, Fast". The New York Times. Retrieved April 2, 2010. ^ Niemela, Jennifer; Kaplan, Daniel (October 1, 2009). "Vikings: MOA buys naming rights to Metrodome field". ^ Deal would put new Vikings stadium near Metrodome Archived 2013-01-27 at Archive.today. KARE, March 1, 2012. ^ Vikings among teams facing major stadium issues Archived July 4, 2010, at the Wayback Machine. Fox Sports. Retrieved on June 19, 2012. ^ Brackin, Dennis – Metrodome? It was when it opened[permanent dead link] Star Tribune, April 2, 2010 The initial reaction to Metrodome was an overwhelmingly positive one, perhaps in part because the Twins played there for the first time just as a blizzard hit the Twin Cities. ^ Rochelle Olson, Stadium land feud ends with cost stretching to $29 million Archived 2007-11-02 at the Wayback Machine, Star Tribune, October 15, 2007. 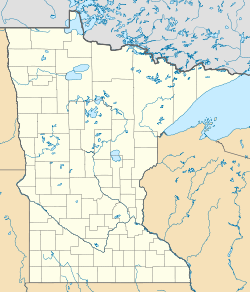 ^ Whatever happened to that Arden Hills Vikings stadium? ^ "Downtown East Stadium FAQs". Archived from the original on 2012-05-15. Retrieved 2012-05-10. ^ "New Stadium Q&A". Vikings.com. Archived from the original on 2015-06-17. Retrieved 17 June 2015. ^ "Vikings edge Lions in Metrodome finale". ESPN.com. Associated Press. Retrieved 16 January 2014. ^ "After last game played, company begins removing Metrodome seats, putting them up for sale". Star Tribune. Associated Press. Archived from the original on 2014-01-03. ^ Moore, Janet. "It's history: Metrodome roof deflated in 35 minutes this morning". Star Tribune. Retrieved 18 January 2014. ^ Sherno, Tim. "Metrodome roof structure demolished with blasts". kstp.com. Retrieved 4 February 2014. ^ Explosion at Metrodome was just part of demolition process. Star Tribune. Retrieved on May 12, 2014. ^ Johnson, Katherine. "Metrodome Demolition on Hold During Investigation into Fallen Beam". KSTP.com. ^ "Metrodome Ring Beam to be Demolished Sunday". Associated Press. ^ Stewart, Megan. "Metrodome Demolition Takes Down Concrete Ring". KSTP.com. Wikimedia Commons has media related to Hubert H. Humphrey Metrodome.